The Kiteboard Tour Asia (KTA) will host an invitation-only event at this year’s King’s Cup to celebrate 25 years of the legendary sailing regatta. 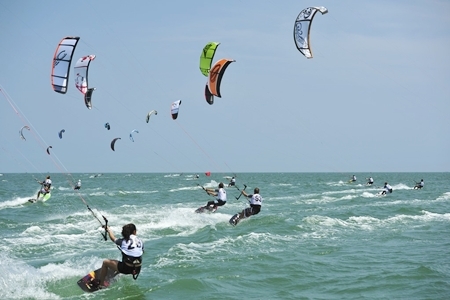 The Phuket King’s Cup recognise the developing nature of the sport; kiteboarding is an exciting and popular new sailing discipline which is regulated by the International Sailing Federation (ISAF) and is being considered as a future Olympic sport. As many as 20 riders are expected to take part in this exhibition event, and the roster will comprise a mix of talented Asian kiteboarders and international pro riders from the World Tour, notably, Narapichit ‘Yo’ Pudla, two-time Asia champion from Thailand, and Aya Oshima, two-time Asia Freestyle/ Race champion and two-time Japanese Freestyle champion will head this exciting demonstration event. An international ensemble also features Ken Nacor, Philippines champion and Asia number 2; Beijing Olympics silver medalist (windsurfing), Ho Chi Ho; Turkish KTA champion and Turkish Freestyle champion Taner Aykurt; and Kathryn Bogwardt, 2010 and 2011 KTA Ladies champion. The sport already has a strong following in parts of Thailand with Hua Hin playing host to the international tour for the last two seasons and Pranburi the Thailand stop on the Kiteboard Tour Asia. The Phuket King’s Cup Regatta is now in its quarter centenary year, after first sailing in 1987 to celebrate His Majesty the King of Thailand’s 60th birthday. With the Royal Patronage of His Majesty the King, the Regatta is organised by the Phuket King’s Cup Regatta Organising Committee under the auspices of the Royal Varuna Yacht Club, in conjunction with the Yacht Racing Association of Thailand, the Royal Thai Navy and the Province of Phuket. 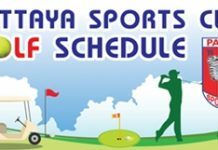 Next articlePattaya Cricket Club dominates Siam C.C.